I would love to own the Legends Framed photo with MJ, Tiger Woods, and Ali. That piece is history, 3 players that changed the world of sports FOREVER!!! Michael Jordan 1986 Auto Fleer RC print. I got to see Jordan play live in 1987 at the old Boston Garden and I got his and Pippens autos. 2 months ago my house flooded and I lost 80% of my 40 year old collection including my only Jordan auto. I cry almost daily about the loss of my cards and autos. I would love to add the Ali/Jordan/Woods Legends of Sport Triple Autographed Legends of Sport Platinum Edition to my collection. Putting the best ever from several different sports together on one piece is unbeatable – at least until you add more sports and make a Quadruple or Quintuple Autographed Legends of Sport. Plus, it’s a visually stunning piece. Now I just need to find a spare $6999.99. Would absolutely love PK Subban “IceCharge Series” with Autographed Hockey Puck I am a massive Habs fan and would love to put that in my collection. I HAVE BEEN A DALLAS COWBOYS FAN SINCE 1965. MY COUSIN LOVED THE GREEN BAY PACKERS SO OF COURSE, I HAD TO ROOT FOR THE TEAM THAT ALWAYS PLAYED THEM IN THE CHAMPIONSHIPS. I WOULD LOVE TO ADD ANYTHING FROM EMMITT SMITH TO MY COLLECTION! Bryan – We could tell how much that goal by Landon Donovan meant to you! Pat – Sorry to hear about the flood and your loss! David – Your wife would let you hang a UDA Jordan piece in the bedroom? We love her! Mark – Hopefully you can get that piece to close some deals in your office! 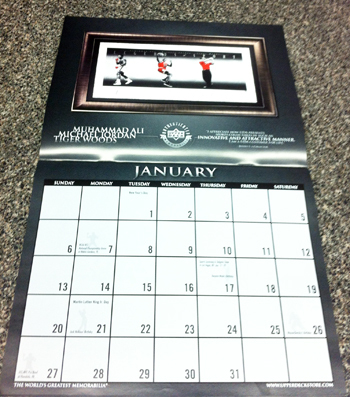 Look for an email from us if you are one of the collectors selected to receive a calendar! Thanks to everyone for participating!!! I choose the Taylor Hall Auto Puck. Growing up in Edm I never couod afford togo to games, so next best was to collect Oil mem. but still @ 36yrs I dont have much. It would just be nice to have a puck signed by my sons hero. I would choose the Tiger Woods Sweet Swing Autographed Framed Poster. This picture optimizes one of the sweetest swings in golf and the backdrop of the golf course and sky behind him is gorgeous. Then is capped off with his signature across the sky.